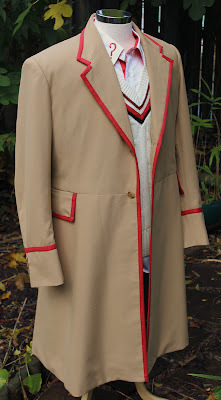 Having now done Five Trousers, and being far into doing the Five Coat, it feels like I have done over half a full Davison costume, though there are a number of items to go to make it truly complete. This got me thinking to write a list of the main costume items worn – though I cannot come close to Bob Mitsch’s excellent Five Breakdown, which is pretty damned definitive. The list, though relatively short, is slightly complicated by the refresh the costume received for the 21st season. At first glance there is little difference, but when you look closer, not much didn’t change. The two photographs below are a good comparison between the Season 19 (left) and Season 21 (right) versions. When the original costume was made back in 1982, several shirts and pairs of trousers would have been made, allowing for spares being cleaned or repaired as well as for stunt doubles. These were used throughout Davison’s first two seasons. 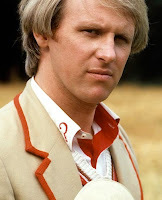 When it came to season 21 in 1984, the wardrobe department completely refreshed The Doctor’s costume, trying (but failing) to match the original version. 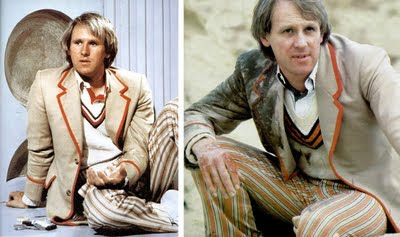 Unless with a comparison, all photographs below relate to the original Season 19 & 20 costume. The original coat was more of a yellow beige, with the notch of the lapel above the scye line. This was remade from a much grayer shade of beige; the lapels are cut slightly differently with a lower notch. The original had a V of narrow knitted brown and black stripes with a broader stripe of red sewn adjacent to the black (see right). The replacement had two broad red stripes sewn on top of a black knitted band at the V neck, as well as now having a waistband stripe to match (see far right). This has red flashing to the button line and under the collar. Much of the red was replaced with green. 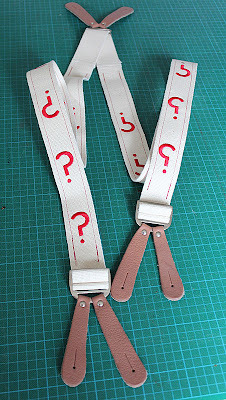 The exact shape of the question mark embroidery varied enormously throughout the seasons. The original trousers had an arrangement of narrow stripes in a mix of cream red, black, green and pink at erratic spacing. The replacements had a more regularly arranged pattern of stripes in cream orange, white and black. 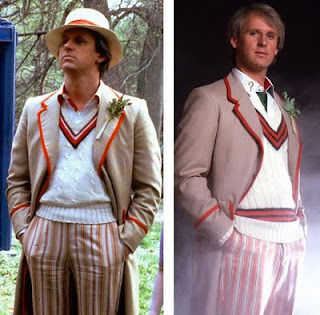 When I did my Five Trousers I initially used the Season 19 design of fabric and made them to a pattern matching the Season 21 trousers from Planet Of Fire, the only time they are seen without the cricket jumper obscuring the waistband. Although the Season 19 trousers are never seen in a similar way, it has to be assumed they also were to the high-waistband cut as well. When seen in isolation the revised Season 21 design does not look much different, but if you do a side-by-side comparison (see below) you realise they are. I felt they were different enough to warrant doing a second Spoonflower design, which has attracted some interest, especially when done in the screen accurate pattern. So, moving forward, I plan to do my Five Coat – which is coming together nicely – and maybe look into the hatband, which is screaming out for a Spoonflower pattern . . .